“May your net always be friendly. May your serve always be true. Tennis, like baseball and golf, is a timeless game. By that I mean that there are no clocks which define the length of a game. Football, soccer, hockey, basketball—all have defined time limits to the game. In theory, a tennis match or a baseball game or a golf match could all go on forever, and the cynics among us would argue that baseball and golf sometimes do seem to go on forever, though the same argument could be made about the last two minutes of a football or basketball game too! In any event, tennis is a wonderful game, and it requires skill, power, deftness of touch, athleticism, quickness, strategy, strength, endurance and mental toughness. It is fun to watch, even more fun to play, and even more fun to play when played well (though you might well ask: how would I know?). 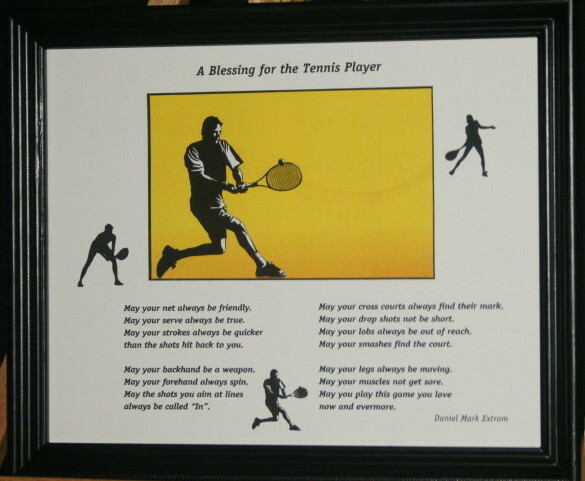 This is a poem for the tennis player of any skill level. Available in white or gold matte, 10 inches by 8 inches (landscape) or 8 inches by 10 inches (portrait), framed in black or light brown. * Insert a photo of your favorite tennis player (which could be you!) 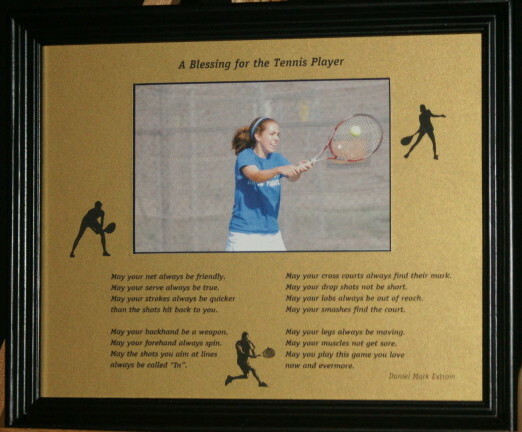 A great gift for the tennis player, or as a prize at a tournament. Regularly only $49.95* On sale for a limited time for $34.99 plus free shipping for a limited time! Sales tax, if applicable, is separate. Purchaser is responsible for sales tax if residing outside of Illinois. *Frames shown are examples only. Frames are subject to availability. We reserve the right to substitute a frame of similar color. Poem Copyright Daniel Mark Extrom 2009-2014. All rights reserved. Available in white or gold matte with black text, in 10×8 (landscape) format or in 8×10 inch (portrait) format. The terms “landscape” and “portrait” refer to the layout of the matte and not to the layout of the photograph opening in the matte, though in this case they are the same. For 8×10 portrait size: 3 inches wide by 4 1/2 inches high. For 10×8 landscape size: 5 1/2 inches wide by 3 1/2 inches high. Choose from black or light brown frame. This piece could be etched also, so that the player’s name and/or tournament name and date could be incorporated. Contact me for pricing and special ordering.